An upbeat collection featuring popular and dynamic Christian recording artists. An estimated 17,000 American youths joined half a million young people from all over the world in celebrating the 12th annual World Youth Day in Paris, France, in 1997. In honor of their commitment and perseverance, OCP released a compilation of 14 songs performed by American artists at this spectacular event. Digitally mastered, Come and See is ideal for simply listening or for lifting your voice to God. The musicians featured on this unique, upbeat collection are some of the most popular and dynamic Christian recording artists. 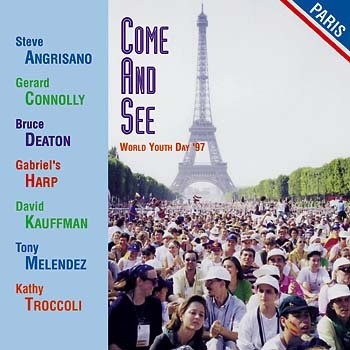 Kathy Troccoli sings her Dove Award-nominated rendition of "I Will Choose Christ"; Steve Angrisano performs a song from his album Make a Difference; and Tony Melendez, whose determination to overcome even the most insurmountable of obstacles has been an inspiration to countless young people, is featured prominently in this collection.